Waukon Feed Ranch’s agronomy team takes pride in the fact that we are continually focused on the future of your farm utilizing the best in crop inputs and technologies. Our skilled agronomy team can offer you knowledge, expertise, and experience that can help you make decisions on a broad spectrum of issues impacting your farming operation. Also, check out our 2017-2018 Seed Guide! Hi, my name is Judd Larson and I am the Agronomy Manager. I grew up in Dorchester, Iowa and attended Waukon High School and Iowa State University. I have been working at Waukon Feed Ranch since 2007. My entire Ag career has been spent at WFR. I enjoy spending time at the family farm as well as many other activities including hunting, fishing, golfing and traveling. Hi, my name is Troy Peterson and I am the Agronomist and Manure Plan Manager. I grew up near Aurora, Iowa on a farm and attended Starmont High School and Iowa State University. 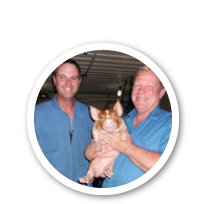 I have worked at Waukon Feed Ranch since 2000 and have been in the agriculture industry for about 20 years. In my free time I enjoy fishing and spending time with my wife Jody. Hi, my name is Kyle Iverson and I work in Agronomy Sales. I grew up in Waukon and attended Waukon High School. I then attended NIACC for my Agricultural Business degree. I have worked in Agronomy for 9 years and have been with Waukon Feed Ranch since January of 2015. In my spare time I enjoy hunting, fishing, and being outdoors. Hi, my name is Mike Horns and I work in Agronomy Sales. I am originally from Monona, but grew up in Harpers Ferry and attended Waukon High School. I started my sales career back in 2002 and have been with Waukon Feed Ranch since May of 2017. In my free time, I like to spend time with my wife and kids and with family and friends. I also like to meet new people, go out on the river, go out cutting firewood, playing cards, golf and fish if I get a chance, and finding time for a good laugh! I look forward to talking with our current and future customers and help find ways to maximize your potential profit, while keeping your cost low. Hi, my name is Sarah Smith and I am the Head Crop Scout and Agronomy Technology Specialist. I grew up in Harpers Ferry and attended Waukon High School. I then attended NICC Calmar for my Agricultural Business degree and certificate in Precision Agriculture. I have been with Waukon Feed Ranch since April of 2016. In my free time I enjoy fishing, boating, hiking and spending quality time with family and friends.